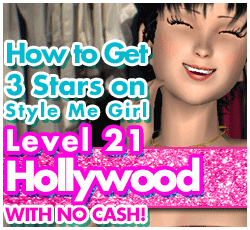 How to Pass Style Me Girl Level 21 Hollywood & Get 3 Stars With NO CASH ITEMS! | I Style Me Girl! How to Pass Style Me Girl Level 21 Hollywood & Get 3 Stars With NO CASH ITEMS! With the right pair of heels, "Stunning," on Style Me Girl Level 21, "Hollywood," is a cinch! Everything I use in this example is either free (comes with the game) or available for silver coin in the Style Me Girl Boutique. If you would like to find out how to get three stars on Style Me Girl Level 21, "Hollywood," without using any cash items, read on! Click on the screen captures in the "Closet Items," box (below right) to view a larger image. In the list below I will go through and describe each item one by one. As you can see in the image at left, I earned three stars for this style on Style Me Girl Level 21, "Hollywood." I hope this helps those that may be stuck on this level. Best of luck to my fellow Me Girl players! Please feel free to comment with your ideas, or if this worked for you! Thanks for your input!